YAY FOR FIRST CONTEST! You're almost there. I want to do another contest, too. =D Not sure if I will or not. WOW! Can you come do my make-up, please? This looks amazing! Hurray for contests! I look forward to it! it's so pretty! I've been looking for a good valentines day makeup look, this just may be it! Very pretty and perfect..... :O)!! this is insane, the pink is gorgeous! That pink is just gorgeous! Very pretty! Compliments your eye color nicely. 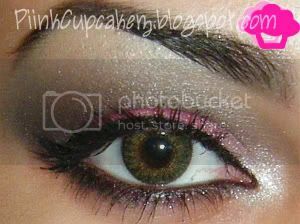 i LOVE that pink in the eyeshadow..it matches your page too!! and i love your page. did you do it yourself?? So nice eye make-up! Totally sweet for Valetine day! omg i lovve the pink! OMGG! LOVE YOUR BLOG THE PINK IS SOO PRETYY. Wow so pretty I love it =) looks so good..